Speaking of Valentine's Day, and I'm going to add President's Day to the mix, it's hard for me to believe that a short, shrimpy, nothing-little-month like February somehow wrangled these two important franchises. I would seriously think these would be observed at a more distinguished time, like March. Except for Spring, March doesn't have many holidays. But President's Day works like this: Abraham Lincoln was born on February 12. We used to celebrate his birth, a great president who worked like a dog to overcome the February curse. And George Washington was born twice in February! Seriously, check out his Wiki page. First, under the Old Style of the calendar he was born Feb. 11, 1731. Then over a year later he was born on Feb. 22, 1732! Unlike his fellow president, Lincoln, Washington had twice as much to overcome. But he made a vow -- deemed foolish at the time -- that he would be the first president of the United States, then he made it happen. Inspiring. Or was it? Did either of these men actually become president in any honest way, or was it all someone behind the scenes, knowing how history would work out, pulling the strings to make it happen? I would suggest that the evidence is suggestive, suggesting some shenanigans. Really, what's the chances that Washington and Lincoln, two of our greatest presidents, should come along and actually be elected? What I'm really saying is that both men were probably involved with the Illuminati, who somehow have control of the strings of time and fate. The implication is they became involved with the Illuminati, but resisted and were briefly found to be unworthy. But when they ingratiated themselves again with the Illuminati, they had to settle for President's Day being in February. Making two strikes against Lincoln and three against Washington. The two men then conferred, Washington saying, "The average people think of February as any other month." Lincoln agreed. And so, ever since, presidents have generally escaped the full berating for their many failings. This whole arrangement took the heat off future presidents, who could now say, "Yeah, but Washington and Lincoln were both born in February." Speaking of scandal. The truth is the Illuminati are always five moves ahead of the people, and the people are always ten moves behind them. There's no sanctity to anything, only evil scandal and no one with the cajones (or brains) to do anything about it. I've been looking at this for a number of years. In those years I've said many times, more times than I can count in hindsight, "The Illuminati wouldn't be the Illuminati if they weren't doing Illuminati-type of things. This is just one more thing in their despicable in-your-face dealings. Their motto is, quite frankly, 'Take it or leave it.'" When you find you're over a barrel, that's the Illuminati. When you're painted in the corner, that the Illuminati. When you're all twisted up inside, with a fever and heartburn, that could be anything. But everything else is the Illuminati. I need to study the Illuminati more, because they're tied in with February, as already illustrated. Still, I'd like to get to the bottom of their mumbo jumbo and find out what makes them tick. It's gotta be something, to keep them in business century after century, yanking everyone's chain, even power players like Washington and Lincoln. As I understand it, they're the ones we have to thank for eyeballs on pyramids (as seen on the dollar bill), the Washington Monument as a national phallic idol, and Betsy Ross' original circular arrangement of stars on the flag. They're big into circles, on the flag -- liking non-linearity -- and their work probably includes crop circles. Time forbids me to list their many invasions into everyday life. 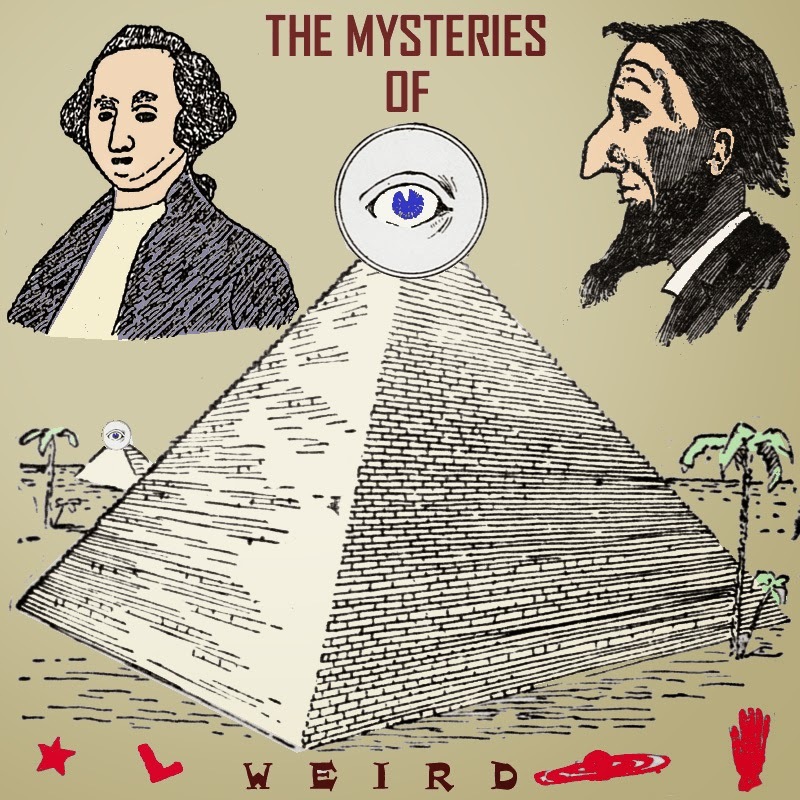 I call it, however, "THE MYSTERIES OF WEIRD," taking the word "WEIRD" as a kind of proclamation that they are God. Such as "WE (that is to say I) R Deity. Toys R Us? No, We R God! Weird. Certainly they've been around long enough, we may as well call them eternal, so maybe they're right.